Warren Gatland was unveiled as the 14th British & Irish Lions coach on Tuesday and he will follow in the footsteps of a rich lineage of men who have led the famous tourists to the southern hemisphere. Next summer, Gatland will head up the squad when they head Down Under and this week's Scrum Sevens looks at who he will supersede in the famous hotseat. The Wales prop played 17 times for the Lions on their tour of New Zealand and Australia in 1950 and was handed the coaching position for their tour to the same two countries in 1966. Robins was the first coach of the Lions but his role was more as an assistant rather than the omnipotence the current crop experience. Robins worked alongside the Lions' manager Des O'Brien and captain Mike Campbell-Lamerton with his skipper leading the majority of training sessions. The Lions fared well against Australia - winning 11-8 and 31-0 - but lost all four Tests to the Kiwis - 20-3, 16-12, 19-6 and 21-11. Lions tourist and Ireland international Ray McLoughlin claimed that they had just 18 supporters cheering on the team in red in New Zealand - a far cry from the current passionate throngs that flock to the other side of the world. The tour was poorly received back in the British Isles but the tourists enjoyed themselves and the party also took in Hawaii, San Francisco, Vancouver, Toronto and New York. With just two Welsh caps to his name, James was a surprise choice to lead the Lions in 1971. But he was a visionary - something that Wales were yet to appreciate. Instead of rousing half-time speeches, James preferred the more softly-spoken approach and pointed players in the right direction rather than ordering them to play in a certain manner. And it worked. They lost their opening match of the tour against Queensland but finished the three-month tour as series winners over New Zealand - something that has never been achieved since or indeed before 1971. They took the first Test 9-3 in Carisbrook but lost the second 22-12 in Christchurch. The third Test swung it in the Lions' favour with a 13-3 triumph and they then drew the fourth 14-14. The likes of Barry John, Gareth Davies, skipper John Dawes, flanker John Taylor and Mervyn Davies etched their names in Lions folklore but the quiet lieutenant James also deserves praise for his steady hand behind the party. A veteran of the 1959, 1962 and 1968 Lions tours, Millar was Ireland coach between 1973 and 1975 and took the Lions post for their 1974 tour of South Africa. 'The Invincibles,' as they are now known, won 21 of their 22 matches with the only draw coming in their final Test against the Boks. It was a hugely impressive performance and one that will probably never be matched again. The four-Test tour saw them win the first clash against the Boks 12-3, the second 28-9, the third 26-9 and then draw the fourth 13-13. Captained by Willie John McBride and under the stewardship of Millar and manager Alun Thomas, the side embraced the physical nature of what the Boks were going to throw at them which led to the infamous '99 call'. Millar went on to manage the 1987 World Cup and was inducted into the IRB Hall of Fame in 2009. He has also been awarded the Legion d'honneur and the prestigous Spirit of Sport award for his contribution to sport. 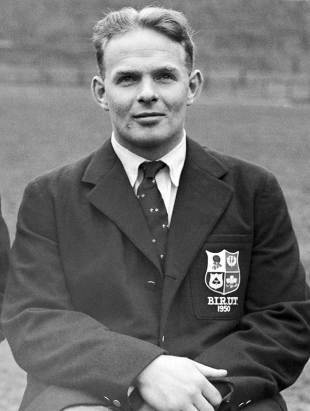 Telfer's working life took in a spells as a head teacher, a chemistry teacher, time as a Scotland international and also the 1966 and 1968 Lions tour but he will probably be best remembered for what is widely perceived to be the best ever speech in rugby (warning - strong language). But while he was part of Ian McGeechan's coaching set-up for the 1997 tour of South Africa, he was head honcho in 1983. It did not quite go to plan for the Lions side as they replicated the 1966 group's fortunes against the All Blacks and lost all four Tests. They also fell to defeats in two of their warm-up matches with Auckland and Canterbury both downing the tourists. In 1997 he primarily looked after the forwards and made that famous Everest speech in the run up to their first Test with the Boks. Telfer's time in rugby also included spells in charge of the Scotland national side and he led them to a Grand Slam in 1984. 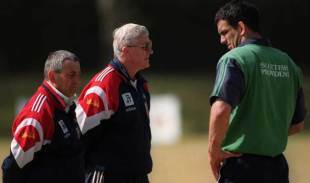 The World Cup-winning coach took charge of the Lions back in 2001 and their tour to Australia failed to live up to the high standards the 1997 party set. Henry's tenure was fraught with rumours of tension between the Test side and the midweek team and Austin Healey and Matt Dawson's comments in the press did little to quell the rumours. Dawson described Henry as "uninspiring" while manager Donal Lenihan supposedly treated the team "like children". On the field, the Lions won the first Test against the Wallabies 29-13 but lost the next two 35-14 and 29-23. Henry later reflected on the tour and admitted that he got his approach wrong. "My ego got in the way. My attitude on that tour was we win at all costs. Winning became too dominant rather than getting to know the players and getting the systems right. You learn from those things." Like his predecessor, Woodward will probably hope that people focus on the 2003 World Cup triumph rather than the 2005 Lions tour to New Zealand when looking at his coaching CV. Woodward tried to modernise one of rugby's last bastions of tradition and it failed. Yes his side faced one of the best New Zealand teams to take to the field - with Dan Carter putting in one of the game's standout performances by any fly-half in the second Test - but it was a tour that never quite got going. They won all of their warm up matches - bar the clash with the NZ Maoris - but they came up against a different beast when they took to the field against the full New Zealand side. They lost the first Test 21-3, the second 48-18 and the third 38-19. The 44-strong party - with 26 backroom staff - were humiliated by the dominant All Blacks and returned to the British Isles with their tail between their legs. 'Geech' is the definitive Mr Lions. Player on the 1974 and 1977 Lions tour and head honcho on the 1989, 1993, 1997 and 2009 parties, he oversaw a 2-1 win over Australia in 1989 but this was followed up by a 2-1 reverse four years later in New Zealand. In 1997, they prevailed 2-1 against the Boks but in 2005 he took charge of the midweek side and not the full Test side. Come 2009 and McGeechan once again assumed the position of head coach and brought in the likes of Warren Gatland, Shaun Edwards, Rob Howley and Graham Rowntree to work alongside him. They lost 2-1 to the Springboks but testament to McGeechan is the fact that on every tour he has presided over, his side have picked up at least one Test win. McGeechan has always had an unwavering belief in the value of a Lions tour amid the ever-reliance on sponsorship and commercial avenues in the modern game. When asked about what the Lions meant to him, McGeechan simply said: "The Lions are special and unique, you can't compare them to anything else you'll do as a player or coach."